The constellations are totally imaginary groupings of stars that poets, farmers and astronomers have made up over the past 6,000 years (and probably even more!). The real purpose for the constellations is to help us tell which stars are which, nothing more. On a really dark night, you can see about 1000 to 1500 stars. Trying to tell which is which is hard. The constellations help by breaking up the sky into more manageable bits. They are used as mnemonics, or memory aids. For example, if you spot three bright stars in a row in the winter evening, you might realize, "Oh! That's part of Orion!" 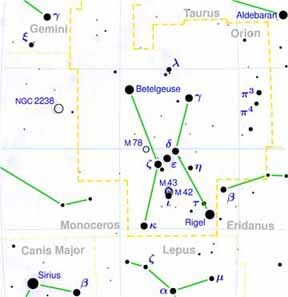 Suddenly, the rest of the constellation falls into place and you can declare: "There's Betelgeuse in Orion's left shoulder and Rigel is his foot." 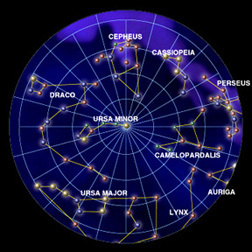 Use the Big Dipper (Ursa Major) to locate the North Star (Polaris). 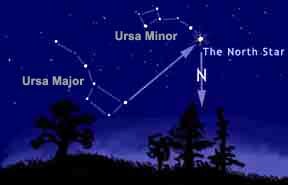 One of the most important stars in the northern hemisphere sky is the North Star, or Polaris. 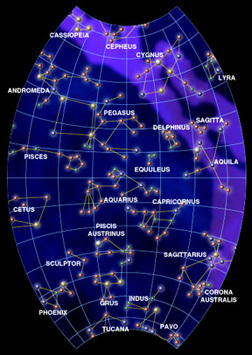 Since this star aligns with the poles of the Earth, finding it is crucial for locating constellations, navigation, telescope alignment, and determining north, south, east and west when you are lost. 3-hour, 40-minute time-exposure of the area around the North Star taken by Herman while camping in the Adirondac Mountains. 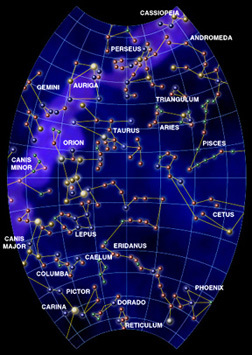 Polaris is not quite true north and describes a small circle over a 24 hour period. In the year 2100AD, Polaris be at its closest to true north before it drifts away (a wobble of the Earht called "precession" ) and in 14,860AD the Earth's polar north will be pointed to Vega which will then be our north polar star. In this photo the star trails are different colors; the blue stars are the hottest and red the coolest. 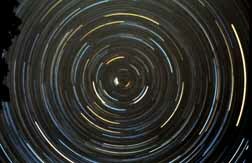 A long time-exposure of the night sky in the northern hemisphere would reveal all the stars revolving around Polaris. Actually the stars stay put, but the spin of the Earth creates this illusion. 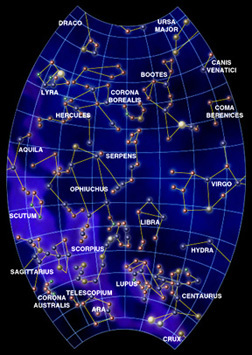 A planisphere is a useful tool for locating the constellations. It's a flat two-part plastic disc, the upper of which rotates according to the date and time. When adjusted properly, a transparent window shows the constellations for that date from horizon to horizon. 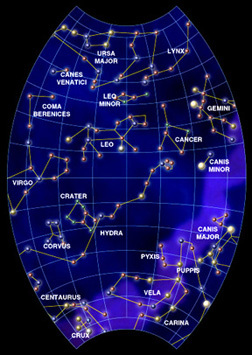 Notice the location of the rivet in the planisphere; it's through the North Star, the center. During the course of a year, the North Star stays in the same position while the constellations and stars appear to revolve around it due to our viewpoint on Earth as it spins on its axis. The planisphere is small and the sky appears from horizon to horizon, so the actual stars of a constellation will be spread out quite a bit. If you purchase a planisphere, make sure it is set up for your latitude – for instance, if you live in Baltimore, get one for latitude 42 degrees north. 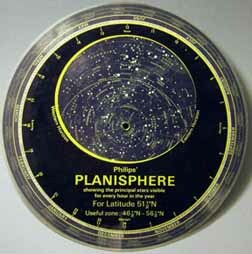 Several types of planisphere are easily available online, book stores, and retail stores that sell telescopes. They range from $8 - $15. When looking for the seasonal constellations in the sky, after you have located the North Star, start by facing east and dialing in the proper month and time of night. Then hold the planisphere directly over your head and orient the rivet (Polaris) correctly. Once you get the knack of it, you'll be able to spot all of them over the course of a year. There are 88 officially sanctioned constellations. They were sancioned by the International Astronomical Union (the IAU) in 1930. Once familiar with constellations, many celestial objects will be easy to find. 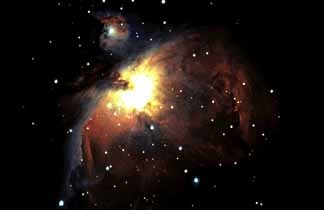 Let’s take Orion, for instance: the sword of Orion contains the Great Orion Nebula (a cloud in outer space consisting of gas and dust), also known as M42. It is faintly visible to the naked eye on a clear night in the winter. 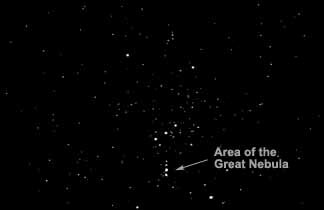 Keep in mind that the nebula is a faint patch of light and not a pinpoint of light like a star or planet. This particular nebula is the birth place of stars; as the gas and dust condenses, the mass eventually becomes so great that it ignites into a new star. To get a better view of this Great Nebula, a time-exposed photograph is necessary. 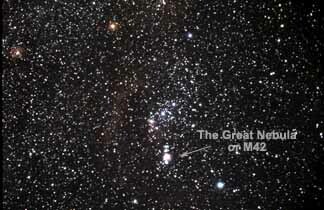 This is what you might see when viewing Orion with the naked eye. The "belt of Orion" and "Sword" are clearly visible. Keep in mind that the stars would be spread out more than in a photo. A 30 minute time-exposure reveals more stars and shows M42 (the Great Nebula) more clearly as a patch or smear instead of a pinpoint of light. Courtesy of John Sanford of Orange, California. This is a close-up of the Great Nebula taken with a telescope and camera. The naked eye can detect a faint patch of light, but a time-exposure is necessary to see this detail. Today's technology is revealing more and more secrets of the sky and you can observe these secrets with a decent telescope, camera and clear skies. This photograph is a 30-minute time-exposure using tracking technology to keep it from moving off the field of view as the Earth spins.